I just read the most wonderful book with this title, compiled by Matt Hern, and wanted to share a few things that I took from it with you. Here are some ideas for great kiddie jokes to play on All Fool’s Day, as well as some steamy ideas for the grown-ups. Ever wondered about this Latin American and Caribbean practice? I’m wondering if they will feature it among the many religious practices they’ve had on Supernatural, myself. Follow my (well, mostly my husband’s!) 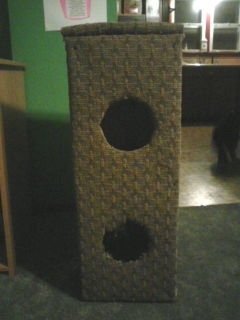 how-to guide to make your own kitty tower (see photo). If you look closely, you can see our new dog, Totoro, in the photo too! Birth Control for Men in Our Lifetimes? No-Mess Markers? Not For Me. Have you seen these markers? Products like these just make me go bonkers. I just think they steal the mess-making fun out of childhood.